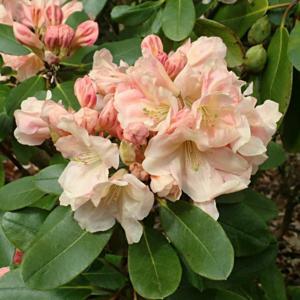 Trusses of large, funnel-shaped flowers with wavy lobes, pink with a hint of yellow, fading to pale creamy pink, opening from deep orangey-pink buds.. Light greenish markings inside. Rounded, upright habit and quite strong growing. Hybrid of R. 'Letty Edwards' x R. 'Crest', raised by Jim Elliott.